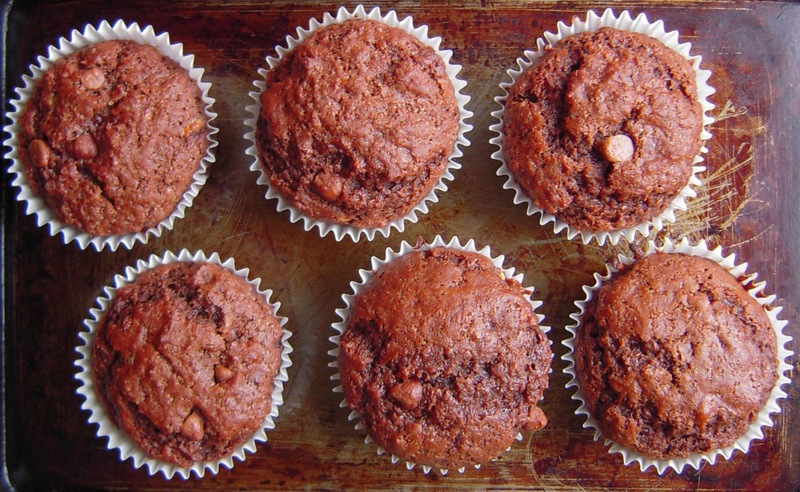 A simple and easy double chocolate banana muffins recipe made with whole wheat flour. Perfect with a cup of coffee. Have a ripe banana lying around, you should definitely try this recipe. 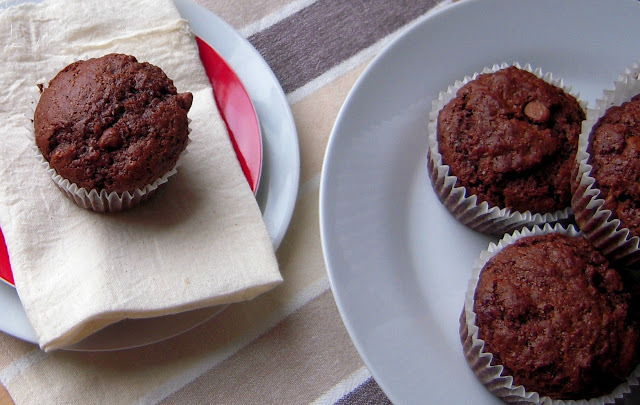 For Egg less Bakes this month Gayathri chose this Banana Muffin recipe. The recipe had eggs and all bakers had to try out the eggless version. As I have already tried a variation of banana muffin, I decided to play with the flavours. So, I added some cocoa powder and some choco chips and for a healthier option used whole wheat flour and oil. The muffins came out very moist and the flavour of banana was not very overpowering. 1. Sieve all the dry ingredients and set aside. Coat the choco chips with 2 tbsp of the flour mixture. 2. Preheat the oven to 175 C. Line a six-hole muffin pan with muffin liners. 3. Make a hole in the centre of the flour mixture and add the mashed banana, oil, yoghurt and water and mix with a whisk. Add lemon juice and choco chips and stir with a spatula. The batter should not runny but of whipped cream consistency. 4. Bake at 180 C for 15-18 minutes. When done, a skewer inserted in the middle comes out clean. 5. Enjoy with a cup of tea or coffee. Anything with chocolate goes directly to my fav, muffins came out super moist and yummy. Very nice.. I did a banana and chocolate variation too, but with chocolate chips! yummy & delicious.. its my first time in ur blog..ur recipes r super..
you got me at the double chocolate...love these muffins. light and delicious. WOW.... this I have to try!